← Does It Make Sense To Pay Off My Mortgage? The United States has not balanced the federal budget since 2001, in fact the federal budget was only balanced for 1998, 1999, 2000, and 2001 since 1970! Also, in every one of those years the budget only balanced because Social Security revenue was greater than expenditures and the government used this excess to say the budget was balanced, rather than putting that money into the Social Security fund. Currently our country spends over half a trillion dollars more than it brings in, which is absolutely not sustainable. Both Democrats and Republicans are to blame, however assigning blame does not move the conversation forward. We need to figure out how to balance the federal budget and move forward with paying down the national debt. The question becomes how can we systematically eliminate the U.S. Deficit, and then, how can we run a surplus to make the national debt clock run in reverse? In order to balance the budget there can be no sacred cows. The major expenditures in the Federal budget are entitlement spending and military spending. IF the federal budget remained revenue neutral and you wouldn’t touch entitlements, defense, or default on the national debt, you would have to eliminate 100% of the rest of federal spending to balance the federal budget. To me this is like earning a $50,000 salary, living in a $1 million home with 2 new vehicles in the driveway and focusing on eliminating the cable bill and Netflix to get out of the mess you’re in. Focus on the big stuff! 1. Eliminate the phase out. Currently Social Security taxes are phased out at $118,500 of income. Applying Social Security taxes to all income (and benefits increase as well under the current formula) we can eliminate 76% of the long term Social Security shortfall. 2. Raise the retirement age: Raise the age from 67 to 69 and index to inflation: This will eliminate 39% of the shortfall. Some economists recommend increasing the retirement age further. When Social Security began the retirement age was 65 and the average life expectancy was 61. 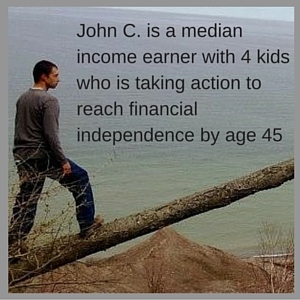 Today the retirement age is 67 and the average life expectancy is 78. 3. Because the program is still not solvent more changes need to be made and we should do it all at once because no one wants to spend that political capital more than once. The last move is to change the COLAs to CPI -1%. This would keep benefits from increasing as quickly. The CPI over states some high yield categories and many economists believe it is not a true indicator of inflation. This move alone closes 63% of the Social Security gap. Enacting all 3 of these measures would make Social Security completely solvent…..And also eliminate $400 Billion in the deficit. The United States military is by far the most well equipped and well funded enterprise ever on the face of the Earth. The United States in our current “peacetime” is spending around $600 Billion per year. The next country on the list is spending only $215 Billion. In fact the U.S. spends more on its military than the next 7 countries combined. This is insanity. We have 10 air craft carriers, and are building several more. Russia has one and China has one…sort of. All the other countries that have them either have one or two, and they are all our allies. We have military bases in at least 63 countries. In 2000, which was the last year we had a balanced budget, we spent just under $300 Billion on military expenditures. If we cut back our military expenditures to this level, we would still spend more on our military than any other country. This one move would cut over half of the deficit. A good place to start cutting is at our overseas bases. We spend over $156 Billion on our roughly 800 foreign bases scattered around the globe. 174 in Germany, 113 in Japan, and 83 in South Korea. I can see having MAYBE a dozen strategic bases in allied countries, but we are way over doing it. This will cut $150 Billion of our military cost, which is 50% of the savings we are looking for. So now we have a balanced budget and are actually running an approx $100 Billion surplus! That’s an amazing achievement, but we aren’t out of the woods yet, we still have $20 Trillion in debt and that $100 Billion hardly makes a dent. What else can we do? 1. It reduces our trade deficit: The U.S. has a roughly $43 BILLION trade deficit every month, that’s over $500 Billion per year. Instilling higher tariffs would encourage U.S. manufacturing and of course have the latent effect of increasing the costs of goods sold in the U.S. to consumers. 2. It generates revenue! In total the U.S. imports $2.3 Trillion of goods every year. A 15% tariff would generate $345 Billion of revenue per year. The danger with tariffs is that other countries respond with tariffs on US goods making it more difficult for U.S. manufactures to sell overseas. When adding tariffs the government needs to be cautious to do it slowly to not kick off a trade war. I’m gonna sound like a big government guy here and lose some libertarian street cred, but that’s OK. We need to increase revenues, and the way to do that is to eliminate some of our tax expenditures. At the heart of the matter all taxation is theft and in an ideal world there would be no taxes and no government. We don’t live in that ideal world. I hate the typical libertarian ethos of, “well there should be no income tax, so we’re going to ignore the details of the tax that exists.” There also shouldn’t be a $20 Trillion debt that our parents and grandparents handed us, but here we are. Mortgage Interest Tax Deduction: The absolute first thing to go is the Mortgage Interest Tax Deduction, Hello $70 Billion. This deduction heavily favors high income and wealthy home buyers and encourages people to over extend themselves on their primary residences. Standard Deductions and Exemptions: If we cut the standard deduction and the personal exemptions in half, the cost per tax payer won’t be that great, but it will have far more people, including myself, contributing money to the federal government. I couldn’t find any figures to support how much revenue this would add, but I can make some rough projections. If the average filer is in the 15% tax bracket, cutting the personal exemptions in half would add $96 Billion (US Pop. of 320M X $2,000 X 15%) in revenue to the budget. This is an across the board cut that would effect everyone. Cutting the standard deduction in half would probably bring in a similar amount. These two items should bring in a combined roughly $200 Billion per year in revenue. So far we are up to a $715 Billion a year surplus with these changes. The U.S can encourage growth and economic output of the country by making some strategy changes in several aspects of society. 1. End the War on Drugs . The War on Drugs is a massive drain on society; not drug use, but the war on it. Our Federal, State, and Local governments spend tens of billions of dollars a year on this program. The “Land of the Free” imprisons a higher percentage of its population that any other country on Earth. When someone is in prison it costs on average $31,000 per inmate per year. Now that person who is locked up isn’t working, or earning any money. Most likely if that person has children the caregiver for those children will end up on virtually every assistance program there is because now the primary earner is locked up. When our non-violent drug offender is released do you think it is hard for him to get a job? ABSOLUTELY. And the types of jobs available will most often be low wage jobs. If we transition from seeing drug use as criminal acts to a health problem and treat people as such, then the nation will save billions a year, lives and families won’t be torn apart, drugs will actually be safer and people can get help with addiction without fear of going to prison. 2. Corporate Welfare Elimination: The government should not pay farmers to grow corn, or not to grow corn. The government should not subsidize oil companies or solar companies. The U.S. spends about $150 Billion a year on corporate welfare, picking winners and losers along the way. The government should absolutely not be engaging in such activities. 3. Greatly reduce child labor laws: I get a laugh when I say that child labor laws are ruining this country, but it’s absolutely true. The jobs our children and teens used to do are now mostly done by migrant workers from Mexico. I’m not anti-immigration, or anti-immigrant worker, but the truth of the matter is that a lot of those earnings go back to Mexico. If we eliminated the working hour limitations on children and the insane amount of special treatments those under 18 have to receive, the U.S. would unleash a major economic engine that has been held back for decades. The income would stay in the communities in which it was earned, our children would learn a solid work ethic early on, we wouldn’t have another generation of precious snowflakes, and U.S. GDP would increase. I’m not saying put 6 years olds in the coal mines, but if you think a 12 year old or a 15 year old can’t pick berries for 8 hours a day in the summer, I think you are being a bit overbearing. Because of the laws in place currently no one wants to hire people under 18. 4. Eliminate Obamacare 30 hour work week: Yes we need to cut the whole damn thing, but this is the biggest drag on the economy. Obamacare declared that 30 hours per week was full time work and that employers had to provide health insurance for workers who work over 30 hours per week. What happened? Most of the “part time” workers who were working 40 hours per week were cut to 29 hours per week. This reduced economic output and increased reliance on social services. If all of these policies were enacted the United States would go from a $500 Billion deficit to over a $1 trillion yearly surplus. But wait…There’s more! After balancing the budget, the President should direct the sale of Federal assets in order to jump start the pay down of the national debt. What federal assets will be sold and in what fashion? The Federal government owns roughly 28% of the surface area of the United States, that’s 2.27 Billion acres. I think national parks are an important resource, but is 28% of this land national parks? No, only 52.2 Million acres is. There’s about 40 times as much land as that owned by the government that is not national parks. Selling off 1.7 Billion acres of land at even a low average price of $1,000 an acre would generate 1.7 Trillion. Most likely the land sales would average more than that. Potential buyers would be individual citizens who own adjacent land, businesses, developers, and conservation non-profit organizations. The federal government also has extensive buildings that it owns that could be sold off. I have no doubt that there are enough buildings that are either vacant or could be made vacant that the U.S. could sell for a hundred billion dollars. We also own a lot of military stuff. From time to time the U.S. has sold arms to its allies (and its enemies), so this proposal is nothing new, except for the scale of it. We have all those military bases we are closing and we really don’t need all of this stuff. We could even sell some of our old aircraft carriers, tanks, and planes to our allies. A hundred billion here, a hundred billion there, pretty soon we are talking about some real money. If the U.S. balanced the federal budget and started generating $1 trillion surpluses instead of $500 Billion deficits, and jump started paying off our debt with 2 trillion in asset sales, we could be debt free in roughly 15 years. Our nation would be safer, our taxes could be drastically lowered, and since we no longer have a national debt, we would save another $215 Billion a year. I know that these changes won’t happen, but it’s fun to think about ways to fix the country’s money problems. The national debt has increased by a factor of 10 since my birth, which is completely unacceptable. What solutions would you make to balance the federal budget? Do you think any of my solutions are politically viable? 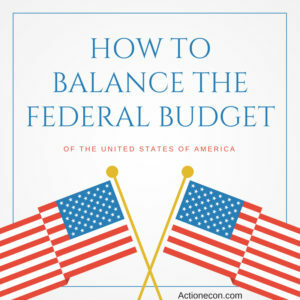 One Response to "How To Balance The Federal Budget"
All good ideas, but politics won’t allow it. The GOP wants to cut taxes, without an equal cut in spending. The Dems want to keep or increase taxes, and keep or raise spending. No one is willing to make the tough calls, and a democratic system doesn’t help. Cut social security or medicare and you’ll be thrown out of office.